Cairns brand helmets have been around for nearly a century, making it a brand you can trust. The HP3 Commando Modern helmet is great option for those looking for something light enough for Wildland, and small enough or EMS and confined space applications, without sacrificing safety. The HP3 Commando Modern Helmet is 10% off right now, and we want you to know about it. This helmet comes in 7 colors, and with the choice of 3 different eye protection (defender shield, ESS Goggles, or 4" faceshield), or the option of no eye protection. It's a rugged, non-corroding, and distortion resistant helmet, and even has insurance against fireground damage and a 5 year shell replacement warranty. It has ultra-high temperature (TPR) edge trim that won't melt or drip, a nomex chinstrap with one-hand quick release, and a patented shell release for increased neck and head protection. 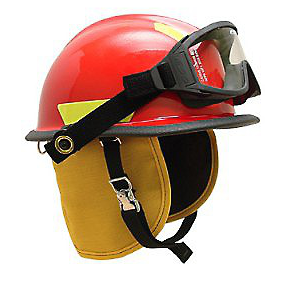 If you get one of the 3 eye protection options, this helmet meets all NFPA requirements too. If you're in the market for a modern, lightweight, but high-performing helmet, then look no further than the 10% off Cairns HP3 Commando. If you're looking for a little extra personalization, you can custom design a 4" front shield using our Build It, See It, Buy It option on our site. Get your Cairns HP3 Commando Helmet, today!